On the morning of the first day of eighth grade, my parents sat me down at the dining room table, over a bowl of oatmeal, to break the news that my dad’s cancer had spread to his brain. Two months later, he was dead. I was thirteen years old. Fortunately, my mom understood the value and benefit of psychotherapy. Throughout my dad’s year-long illness and the years after his death, my mom shuttled me weekly to see my therapist, Lois, an older woman with wiry hair, a sweet smile, and a gentle voice. Those talks made all the difference in helping me find ways to cope and survive the devastating loss of my father. Years later, in college, as my classmates and I struggled to choose what paths to take, I repeatedly heard friends announce their intentions to become teachers, honoring the inspiring educators who had instilled in them a passion of learning. I certainly loved many of my teachers from elementary school through university. But even more so, I loved Lois, who had sat with me in her office week after week, listening and talking—about what exactly, I now no longer remember. But those talks made all the difference in helping me find ways to cope and survive the devastating loss of my father. Thus, it dawned on me that I wanted to become a psychologist in order to help others also learn to build resilience and endure adversity, trauma, and their own personal Option Bs. Reading the literature on resiliency helped me put words to many of my own experiences. After graduating college, I accepted a two-year research position at the Mount Sinai School of Medicine, with a team studying post-traumatic stress disorder (PTSD) and novel pharmaceutical treatments. It was inspiring to work with this population and observe the ways in which they had built resilience, whether through optimism, social support systems, altruism, or even the use of humor. While there, I also helped write a review article on resilience. Reading the literature on resiliency helped me put words to many of my own experiences. For example, research has found that striving to find meaning in one’s life and reassessing traumatic events to find any type of silver lining is associated with more successful adaptability in the face of adversity. Now, as a fifth-year clinical psychology Ph.D. student, I have continued to find meaning in my life by conducting my dissertation research study on interpersonal functioning in adulthood after the death of a parent in childhood or adolescence, focusing particularly on romantic relationships. 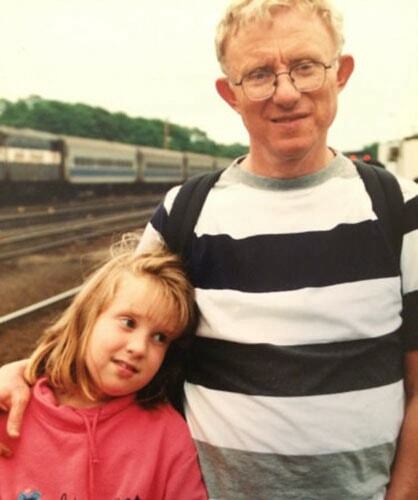 Channeling the loss of my father into my research and my career as a psychologist is one way in which I find meaning, am resilient, and continue to feel connected to my wonderful dad, even though I only knew him for thirteen years. Solara Calderon grew up in New York City. She attended Johns Hopkins University, where she earned a B.A. in Psychology and Poetry. She is now a fifth-year Clinical Psychology Ph.D. student at Long Island University-Brooklyn.